Alice Ogden of West Franklin, NH outdoes herself again this year with another incredibly beautiful basket for my Christmas tree. 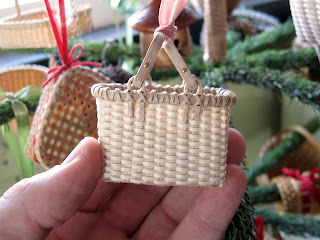 Measuring only 1" wide x 2" long x 1 3/8" high it is a perfect scale replica of her full size double swing handle basket. Alice has making black ash basket ornaments since 1995 with a new design each year since 1997. I am fortunate to have all of her designs gracing my tree (which I actually leave up all year in my weaving studio). 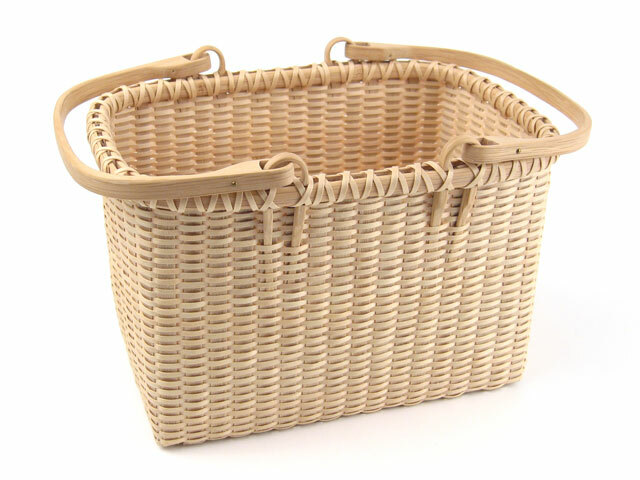 Alice not only processes all of her splint and hand carves all of her white oak handles and rims she is also a great basket weaving instructor. 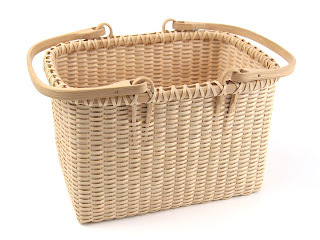 I made a full size version of this basket back in 2003. 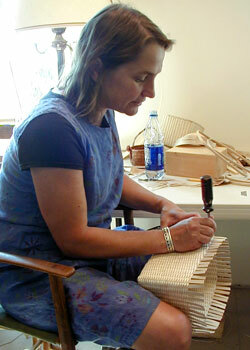 Alice packing one of her full-sized double swing handled baskets.